1 of 1 Heat oil in a skillet over medium-high. Add garlic and cook 2 minutes; stir in tomatoes, salt and black pepper. Break up tomatoes and simmer 3 minutes. Add chicken to skillet. Stir in red pepper, onion and cherry peppers. Cook, covered, 10 minutes, turning chicken after 5 minutes. 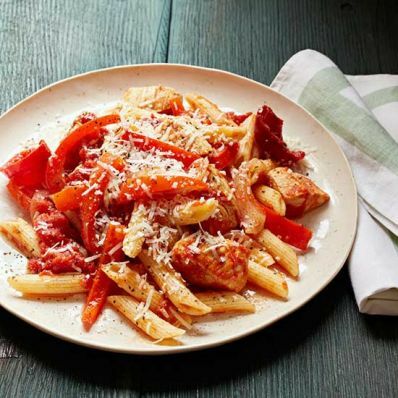 Serve with penne and Parmesan. Per Serving: 6 g fiber, 62 g carb., 1070 mg sodium, 14 g Fat, total, 46 g pro., 560 kcal cal.